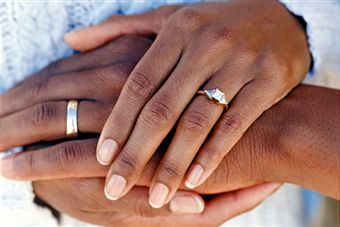 Covenant Relationships: What Did You Do With Your Wedding Rings? I know that for some the ring has "shrunk". Nah, your wife's cooking did that. It's possible that you're retaining water, if you're a woman. It's OK; you can get that ring resized or go on a number of finger-specific diets- if there are such things. Then there are "I'm not Into That" men (and a few women) who just don't like jewelry. They've never worn it and why start now? But what message does this send to your spouse who loves you enough to show the world their commitment? Perhaps it's a case of - What's Good For The Goose Is Good For The Gander "My husband isn't wearing his ring, so why should I?" The quid pro quo defence is hard to argue against. What is a marriage if not a, hopefully, life-long game of one upsmanship? huh? Whatever may be your reasons, intentions or lack thereof for not wearing your ring remember it represents the commitment you made and the vows you shared with the person you love. It is a sign to the rest of the world that you found the one person you desired to spend the rest of you life with. At least it should, anyway. And why wouldn't you want the world to know that? I wear my ring with pride. I love being able to quickly smile and flash it whenever necessary. Those of us who are married have to be really careful with how we represent our marriages. Not wearing a ring can definitely send a message that you are available, interested or having trouble at home. I’d rather us wear our rings with pride because of the lifelong love commitment we've said “I do” to. A few years ago, my husband bought me one of those beautiful diamond wedding rings for women as a symbol of our union and unending love. The only time I take it off is when I'm washing things using harsh chemicals like detergent and when I go swimming at the beach or pool. Other than those times, I always wear the ring. Beautifully controlled and paced. terribly moving and also the author offers a robust sense of place, a worthy winner.